From part 1 I had narrowed it down to the vendors that I had chosen would be quoting on my upcoming wired and wireless infrastructure replacement. We started to look into wireless broadcasting or screen mirroring as a 2017 Christmas project. Our teachers and the ICT Department had wanted to bring in wireless screen mirroring for a while, but it was actually some upcoming renovations that make it a priority for us. We had a committee of Teachers who were planning out new classrooms, and they wanted not just one to one mirroring, but also one to four or four to four in a room mirroring pre-room. In this one building, it would give us between 35 to 40 individual streams. 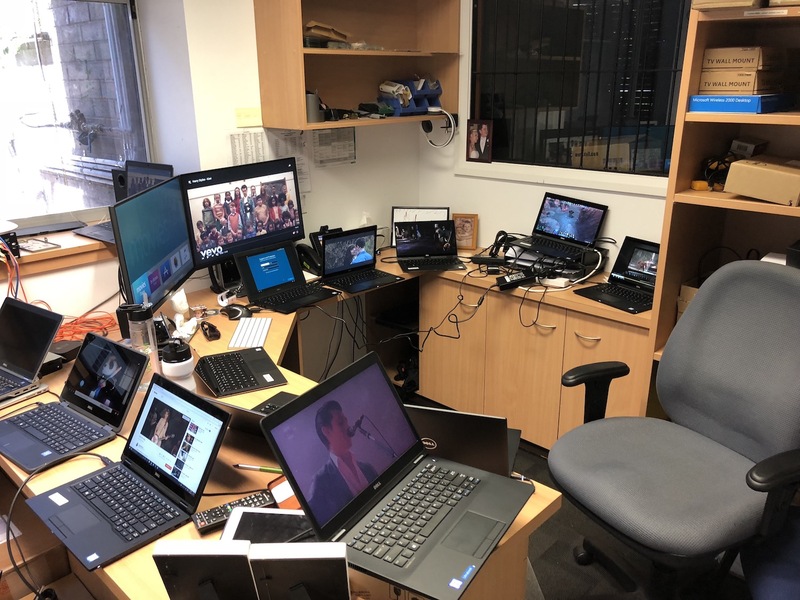 This sent me and our AV Technician off to review a range of wireless mirroring options and what was possible for us to use. We reviewed any product we could get our hands on. Airtame, Kramer, Apple TV’s, Vivi and a range of other ones that I can’t remember. After some intensive testing and working out we had come to Apple TV’s as being the one for us. As much as I love Apple hardware this did not thrill me, the thought of managing Apple TV on a corporate network was something that sent me into cold sweats. I had rolled Apple TV’s out before and found that they have some big issues when you bring them into corporate networks. The user experience of connecting to screens can be flawed as well, you can’t restrict who can see what screens, and hundreds can appear. Especially in schools where staff and students can have products like AirServer running. For us, we wanted something that gave a great performance, easy to use for staff and had enterprise style management of the products. Despite my worries, it gave us the best mirroring solution we had tested. Mac/iOS to AppleTV was amazing and just worked flawlessly. Windows to AppleTV was not as great but with applications like AirParrot, it worked and AirParrot has some great features built in that we felt it was a solution we could move forward with. We went from testing one to one devices to testing one too many devices. Remember our teachers wanted to have multiple streams running around a room… potentially four per room. So, I ordered an additional 3 Apple TV (4th Gen). This is when I started to run into problems. The wireless network was getting congested with 4 wireless streams running on the AP in my office, it worked but you could tell it was struggling. I pushed forward, adding 20 additional devices on the network doing a range of different tasks, I could still get everything working but not at 100%. HD streams we were starting to see artefacts appear in the quality of the mirroring, and we saw sound was no longer in sync or we would get pauses in the playback. The Director, our AV Expert and I came to the conclusion that 1 AP was just not enough to handle the potential load, and 20 additional clients were not even the max I would ever see in a classroom at one time. I had chosen 20 because it was the amount of device I could fit in my office. Figure 1. My office loaded with test clients. We decided that we would need to run 2 AP’s in a room to achieve our wireless mirroring solution. This, in turn, brought about 2 issues that we could detect. The first was that we needed the AP’s to effectively perform load balancing based on bandwidth, and secondly, would we have enough channels to work with (issue 2 will be covered in a different post… spoiler alert we made faraday cages out of our classrooms). When loading up 2 Aruba AP’s in my office we were able to get it those artefacts and voice sync issues to go away. At first, we only appeared to reproduce this load balancing on Aruba gear. However, a quick email to Leader Systems and I got the following email back. Figure 2. Email about load-balancing over bandwidth for Ubiquiti. On Ubiquiti’s website they don’t actually say load-balancing over bandwidth as a feature for 5.6.22 but it does mention load balancing (https://community.ubnt.com/t5/UniFi-Updates-Blog/UniFi-5-6-22-Stable-has-been-released/ba-p/2131913). This update had come out days before I sent my email to Leader, I updated my controller to 5.6.22 before the update I found that there wasn’t any type of balancing other than if I hit over 30 clients. Though with the new update I saw the following happening. From the above image, you can see that my 2 AP’s were sharing the clients but not evenly. One was taking the lion’s share. But interesting if you look at the CH UTIL. 5G (Note: 2.4 GHz was off). In the test lab, I had 4 machines doing wireless mirroring, and the others doing a light load. The wireless mirroring ones clients had gone to the EDU AP while the Pro was handling the other clients. After we had found that we moved onto the next phase… deciding between Aruba and UniFi. The other vendors by this point had been ruled out for a number of reasons, mainly being we couldn’t get good wireless mirroring on them or their price was too high. Before I finish this post off, the price has come up again. Now as you might have guessed from my other posts about monitoring and my first post I am a strong believer in saving money where I can. To me I work in Education and any dollar I can save in the IT Department can be put back into the classroom. I won’t go into saying what each quote came to for the different vendors if you want that unfortunately, you will have to go somewhere else or contact them yourself for pricing. Comparing wireless vendors is actually a very time intensive exercise because they have different features and licencing costs, one has a physical controller which costs more than the virtual and so on. And I also don’t believe in going for the cheapest just because it is the cheapest, that is how you end up with crappy systems. In my next post you will see how I came down to using Ubiquiti.